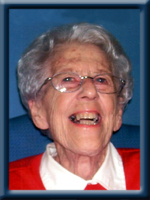 SIMMS – Marie drew, 93, of Brooklyn, Queens County, passed away peacefully in Mahone Nursing Home on Monday, December 3rd, 2012 . Born in Brooklyn, she was a daughter of the late Herbert and Ida (Baker) Smith. Marie was a former counter clerk for Simpsons in Liverpool and an office clerk for Thompson Bros. (later Steel and Engine Products Limited – STENPRO) as well as Mersey Paper Company. She was a member of Pilgrim United Church in Brooklyn, the UCW and was a Sunday school teacher for many years and served as superintendant. Family meant the world to Marie and she was especially proud of her grandsons Ryan and Joel. She will be fondly remembered as always having a smile, dearly loved and will be greatly missed by all who knew her. She is survived by her daughter Cynthia (Rowen Shinder) of Moncton; her son John (Heather) of Brooklyn and her grandsons Ryan and Joel. She was predeceased by her husband Clare and her sister Reta. Please accept my condolences with the passing of your Mum. I am sure you will miss her. Sorry to hear of Marie’s passing. She was a very kind lady. She taught me in Sunday School and also helped me when I was teaching. Hold onto the beautiful memories and know she is at peace. John, Heather and boys – So sorry to hear of Marie’s passing. I will always have fond memories of her and you will too. Hold onto the memories – they will help you get through. Thinking of you all. Cindy and Johnny…so sorry to hear of your mother’s passing. Our prayers and sympathy go out to both of you and your family. I won’t be able to come to the funeral because of my hip, but Paul will be there, but I will be thinking of you. TO MARIE’S FAMILY JUST TO LET YOU ALL KNOW THAT MY THOUGHTS ARE WITH YOU ALL AT THIS DIFFICULT TIME . My heartfelt love and condolences to the entire family.I know your Mom and Nana is in a much better place now, with her Lord and will always be watching over you. She was one fine lady and I will miss visiting with her when home. My heart is very heavy with sadness and I am very sorry to hear of the passing of your mom. I want to express my sincere condolences for your loss. Cindy… Thank you for all the many fond memories, chuckles, and laughter that we shared with your mom. She had a way of always making things seem “ok” with her kind words and gentle mannerisms. I want you to know that my thoughts and prayers are with you across the miles more than you will ever know. John and family: We were sorry to hear about your mother. Our thoughts and our prayers are with your family. Thinking of you in your time of sorrow. Sorry to hear of your loss.Remember your mom well. Sorry for your loss. Memories are so wonderful to have and no one can take them from you enjoy all that you have. She was a special person. Sending condolences John to you your family in the passing of you Mom. John & Cindy and families we send our deepest sympathy to all of you. She was one of my Sunday School teachers and I have many good memories of Marie. God bless you all. John, Heather – so sorry to hear of your mom’s passing. We will be thinking of you as you deal with this difficut time. Hugs. Sending sincere condolences to Marie’s family. I knew Marie through the church and she was always friendly. So sorry to hear of your Moms passing. I remember my Mom (Dot Smith, Shelburne) always talking about your Mom from church meetings etc, she was a good friend. They thought it was great having daughters with the same name and how we used to play broomball together. Cherish your memories they do help as we lost Mom in 2010. Our thoughts and prayers are with you and you family at this difficult. Cindy: I am sorry to learn of Marie’s passing. My thoughts and prayers are with you today and in the coming days. Marie was a lovely lady and will be missed by many. Sincere sympathy to your family. so sorry to hear of your Mom’s passing. May your good memories help you in your time of sorrow. Live, laugh, love… that’s what our Mom’s would want. John and family: we were very saddened to hear of your Mom’s passing. She was a very warm and lovely lady and will be missed for sure. Our thoughts and prayers are with you all at this sad time. John, Heather and family: We were saddened to read of your dear mothers passing. She will be remembered for her thoughtfulness and love for her neighbours and family. She had one of those smiles that lit up a room and it seemed to be always present. She loved life and truly lived by the “Golden Rule”. My sincere condolences to the Simms family on the loss of your mom.Take care in knowing the memories of her will be in your hearts forever. Cindy, John and families: My condolences on the passing of your mother. I remember her from Sunday School and other church activities and recall her ever present smile and gentle demeanor. Cherish your memories of her and a life well-lived. So sorry to hear of the loss of your mom.Treasure the memories of her as she will be in your heart always. I am sorry you have lost your Mom. My sincere condolences. Cindy: I am sorry for your loss. My sincere condolences. wonderful lady. We will always remember her beautiful and sincere smile, and her love of singing. Cindy; We are holding you and your brother’s family in our thoughts and prayers.It was a privilege to have known Marie.She was a beautiful lady. So sorry to hear the sad news of the passing of your Mom, sending our heartfelt sympathy to all of you . We are so very sorry to hear about your Mom’s death. She was such a special, happy person and it was always a joy to be around her. You were so fortunate that she was able to live to the age of 93. Marie will be missed, but there are wonderful memories of her from years gone by. Our thoughts and prayers are with you and your family. Will be in touch, Cindy. Take care. John, Heather and Boys…..I was saddened to hear of your Mom’s passing. Keep your fond memories of her always in your hearts! John and family our thoughts are with you at this sad time.one of the good things you have had is that she lived a long life. i am sure you have many menories. So sorry to hear of your Mom’s passing. She was a very special lady. I enjoyed our time with her when our choirs would get together. She was always so positive, and always had a smile for everyone. Please accept my condolences in the loss of your mom,my thoughts and prayers got to you all at this most difficult time. your memories, for they are yours forever. Wendy and Fred Wamboldt. Sorry to hear about the passing of your mother. Our thoughts are with you. I am so sorry for loss. My thoughts and prayers are with you all. To Cindy and Family; My sincere sympathy on the loss of your dear mother. She was a very sweet lady and always a joy to be around. May God be with you and comfort your hearts at this sad time. So sorry to hear of your Mom’s passing. She was such a special lady and so full of life. My thoughts are with you and your family. On behalf of my mother and myself I would like to offer you our deepest and most heartfelt condolences to you and your family. So sorry to hear of your mom’s passing. She was a lovely lady and will be missed by all. She had a beautiful smile . Our sincere sympathy to you and your families at this difficult time. Very sorry to hear about your mother’s passing. Our thoughts are with you and your family. I remember your Mom and ” aunties” visits to Moncton from years ago. They always had such fun. I remember them both giggling up the driveway! Could hear their laughing before catching sight of them! My sympathy to you at this time. May fond memories and faith hold you.